Phew, what a Gen Con! It was my first time selling at the largest tabletop gaming convention in America. I learned a ton, but I think I made enough contacts, showed my games to enough people, and made back enough of what I spent, that I can consider the convention a huge success. I was there. And I was all over the vendor hall. Last year, I set up a table in the Event Hall, but I was only able to draw about 20 people in 5 or so events across the event’s five days. But when I had Battle Merchants set up in the BGG booth for a video, I had five people come up to me in the space of 15 minutes! I knew then that I had to find a way into the Vendor Hall. Being there is important. Gen Con is a pillar for the gaming community. Gamers look to it to find the new games for the coming year. It’s how to stay relevant. I had an amazing boothmate and an incredible location. I split a booth with Nazca Games, which is run by Emerson Matsuuchi, of Volt and Specter Ops fame. I’m learning so much from Emerson. He embodies professionalism and passion. I want to be him when I grow up. Best of all, Emerson insisted on helping me demo my games when I was short on manpower, even though I told him that he should focus on his own games. And on Sunday evening, I returned to the vendor hall to pack up my booth, only to discover that he and his team had done it for me! I, and my booth staff, were friendly and fun to demo with. I’ve seen lots of booths with surly demo-ers, and it’s not surprising to find out that they just don’t want to be there. Selling at a convention isn’t for everyone, but if you’re not feeling it, your customers will sense it. I’m very lucky that I genuinely love to show off my games. And while the way I talk is a little awkward – words have a way of crashing into each other as they fight to get out of my mouth – I hope my passion comes through. For every 10 groups I demoed Bad Medicine and Battle Merchants to, I’d say I sold 8 or 9 copies. I wish I’d been at the booth longer… more on that in a moment. Most importantly, I made sure that my demo team were soft sellers. We’re there to show the game, not to force a sale. I think this technique works; I had a few people who didn’t buy my games at Origins return to buy them here instead. And it’s good to be there just to meet fans. It’s strange for me to say, but I had several people who came by to tell me how much they liked Battle Merchants. That means the world to me. I spread myself out. In addition to the booth I shared with Emerson, I spent some time demoing Bad Medicine at the Ad Magic booth, and the Indie Game Alliance demoed The Networks a couple of times on my behalf. I also bought some time at the First Exposure Playtest Hall, and was able to get feedback on the game’s graphic design from 16 enthusiastic testers. I ran evening events. Unlike Origins, my evening events were extremely well-attended; I had about 50 people try my games across all three evenings, and many of them showed up at my booth the next day to make a purchase. This is definitely something I’ll do again next year. I brought a bunch of business cards with appropriate web sites. It’s so important to give some material for people who are interested in my games. Perhaps I just did a demo in the event hall, and someone wants to remember the game. Perhaps I just showed a game at my booth, and a person wants to come back later to buy the game. Being able to hand out something physical, even a tiny business card, is huge. And if they don’t come back to my booth, they can go to the appropriate web site on the card and get more information about the game over there! I ate regularly, went to sleep at a reasonable hour, and didn’t push myself overly hard. My schedule was crazy, sure; show up at 9 am to start demos, leave at midnight. But I knew I could do it for three days, especially because I didn’t stay too late, didn’t force myself when I was feeling tired, and made sure I ate three meals a day plus snacks. I find it vital to make a pre-con supermarket run where I can pick up stuff for sandwiches and snacks, especially when my hotel comes with a mini-fridge. I will get more help. This was my biggest mistake. I had only two volunteers, and we had three places to spread out. 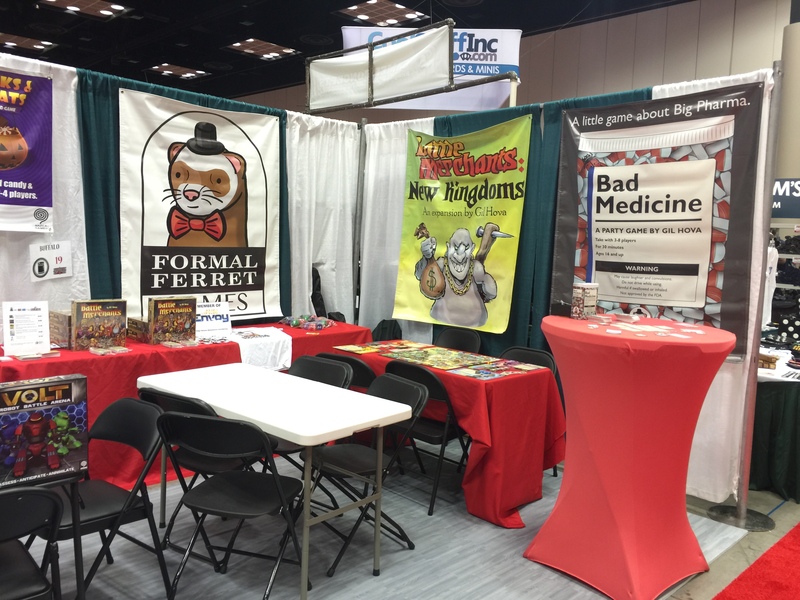 We wound up not staffing the Ad Magic booth during all hours, and we only had one person at the Formal Ferret booth at any given time. Next year, there will be at least as many people at the Formal Ferret demo area as available demos, with extra folks to handle shift changes and other demo opportunities. I will remain at the booth during vendor hours. Gen Con is my opportunity to see people I only get to see a few times a year. But I had no fixed address at this con; while I made sure my booth was always staffed, I was not there on Friday or Saturday; instead I ran demos at the FEPH and the Ad Magic booth. This wasn’t good; I missed a bunch of people who wanted to say hi or interview me. Wasted opportunities, darn! I will be sure to be more available next year, and to have a volunteer handle any demos that happen outside my booth. I will print my booth number on my promotional materials. This is a nice touch I need to make sure I handle next time. Gen Con is huge, and those booth numbers are easy to forget. I usually wrote down my booth number on the back of the card, but it will be easier next year to just have it on the card in the first place. I will keep my evenings free. I ate dinner hurriedly this year, wolfing a salad down while setting up a 7 pm event. As a result, I missed a bunch of prototyping and networking opportunities. So next year, I will entrust evening demos to a volunteer, leaving me to go to dinner with people I don’t get to see often. Some amazing things result from those simple encounters. I will take more photos. I only had four or so photos on my phone once the smoke cleared, and none of them featured me demoing anything. It may seem narcissistic, but these photos are really good for newsletters and Kickstarter updates. I’ll be sure to have better documentation next year. Overall, it was a heck of a convention. I know it was good because it only felt 30 minutes long! Here’s to another “30 minutes” next year. I’m glad the con went well for you. I saw you when I was walking the vendor hall with my daughter on Sunday, but you were demoing so I didn’t interrupt. I think we said hi at some point. But I can’t remember when; it’s all such a blur! Thanks for all the good information. I had a similar revelation on my previous trip when I demoed Nothing Personal in the vendor hall. The vendor hall is the life blood of Gencon. Sooner or later, everyone at the con is going to pass through there. Its far more easy to remain stationary and the wave of people flow around you. As much as I hate being tied down, Gencon is the exception to that rule. Travelling around is problematic. The convention is huge, crowded and the time you spend moving form place to place is wasted. This year I didn’t schedule meetings earlier because of a family event. Consequently I had to work 3 times as hard to show prototypes and make meetings. Next year I will start making plans much earlier. 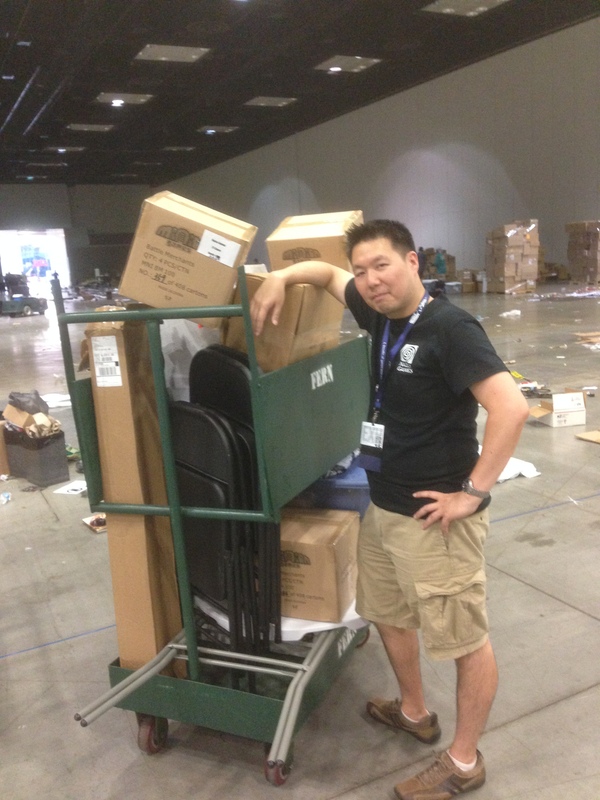 Yes, Gen Con is really about finding a home base and using it as well as possible. I’m certainly going to do better on that front next time! I demoed The Network with a friend of mine a the FEPH. I thought it was a great game. I liked the idea of setting up the show slots and having to have actors and/or ads to complete the show. It was really fun and easy to pick up. The concept is new and refreshing! I think your graphic design was really good and laid out using your available space wisely. I can’t wait for the KickStarter of The Network. Additionally, Battle Merchants was mentioned during our play test. 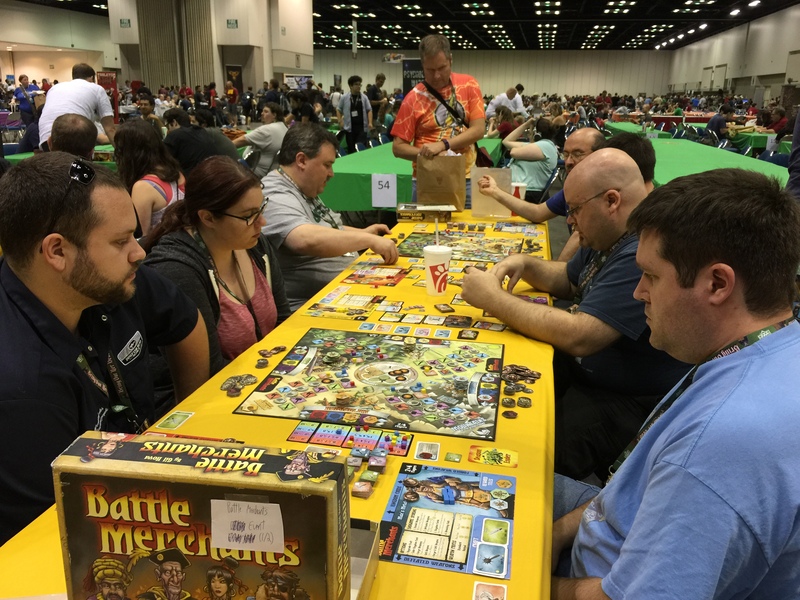 The next day my friend, another friend, and myself went to your booth and demoed Battle Merchants. Let me just say I bought it and we can’t wait to play a full game on our next game night. It’ll be a while until my game will be GenCon ready, but I’ll definitely have this tucked away for later use. I like that you mentioned food/sleep on your list — I think that’s a great point to make. It’s not only about placement, it’s also about treating yourself correctly so that you don’t burn out. I’d love to see you there, Lori!